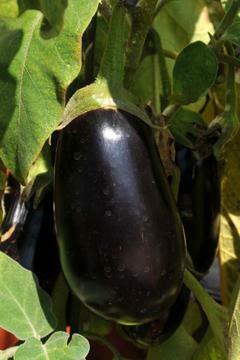 White flowers in summer followed by large oval very dark glossy black-purple fruits, produced relatively early. Good flavour. Shrubby habit. May be perennial in warm climates, but normally grown as an annual. Deep, rich, fertile, moist, well drained soil. Warm position in sun or part shade, needing a constant temperature of about 25 to 30°C to produce good fruit. In cold areas best grown under glass. Plants take about 20 weeks to fruit. Pinch out growing tips to encourage bushy growth. From seed, sown at about 21°C in spring. Old variety introduced about 1910.